AEROSPACE FORMING, SEAM WELDING, AND MACHINING. MOUNT TOOL CHANGER, 20 ATC, S/N 387. BIRMINGHAM VERTICAL MILL, VAR SPEED, DRO, AND P.F. 2) MAGNAFLUX PARTICLE TESTING UNITS. WYSONG MODEL 236-HR, 3FT X 22GA POWER ROLLS. HUSKY 7 HP VERTICAL AIR COMPRESSOR. CRAFTSMAN DRILL PRESS, BALDOR GRINDERS. TURN PRO 7’’ X 12’’ HORIZONTAL BAND SAW. HEIGHT GAGE, CALIPERS, MIC SETS, AND ETC. GILBERT MODEL 1C-1 SURFACE ANAYLZER. MOJAVE 4FT X 6FT GRANITE PLATE. TOOLING, VISES, TOOL HOLDERS, CUTTERS, AND ETC. ALUMINIUM MATERIAL, RACK AND SUPPORT. CAT 5000 LB LPG FORKLIFT, MODEL T50D. 2003 ACCUPRESS MODEL 710010, 10FT X 100 TON HYDRAULIC PRESS BRAKE, WITH ETS CONTROL, S/N 7523. 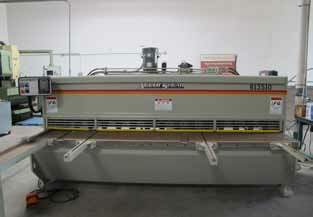 2003 ACCUPRESS MODEL 613510, 10FT X 10 GA HYDRAULIC PRESS BRAKE, WITH CNC BACK GAGE, S/N 4533. JETLINE WELDING POSITIONER, 12’’ TABLE, VAR SPEED, TILTING. ACME 75 KVA PRESS TYPE SPOT WELDER, 24’’ ARMS, iii CONTROL. SCIAKY 100 KVA ROLLING SEAM PRESS TYPE WELDER, 38’’ ARMS, INTRON RESSITANCE CONTROLS, S/N 10831. SCIAKY 200 KVA PRESS TYPE SPOT WELDER, 48’’ ARMS, H & H CONTROLS, S/N 7706. SCHREIBER TRUE TON CHILLER, MODEL 500-AC, DIGITAL DISCHARGE/RETURN. UNITED SPEEDY MODEL LCH-10 TENSILE TESTER, DIGITAL, S/N 0404409. MORI SEIKI MV-45/40 CNC VMC, 40 TAPER, FANUC 6M CONTROL, SIDE MOUNT TOOL CHANGER, 20 ATC, S/N 387. 2004 BIRMINGHAM 26’’ X 80’’ ENGINE LATHE, 36’’ SWING IN GAP, 1600 RPM, MODEL DL-2680L, S/N 708. INSPECTION TOOLS, TESTING EQUIPMENT, GAGES, PIN GAGES, HEIGHT GAGE, CALIPERS, MIC SETS, AND ETC.